WHAT IS COMPLETE THERMOGENIC™ POWDER? Complete Thermogenic™ Powder incorporates an exciting array of research-proven nutrients to support normal lipid metabolism and performance – all in an industry-first, drinkable format. Designed to mirror our best-selling Complete Thermogenic™, this formula has been carefully constructed for those who would prefer to consume a refreshing drink, as opposed to taking tablets, in order to support fat metabolism. Each serving provides a unique combination of ingredients, which include: Green Tea, Caffeine, Raspberry Ketones, Choline Bitartrate, L-Tyrosine, L-Theanine, Acetyl L-Carnitine and BioPerine®. This blend of nutrients, available in 2 refreshing flavours, makes Complete Thermogenic™ Powder a leading formula and the very first of its kind. Complete Thermogenic™ Powder is designed to be used in the morning to support fat metabolism and/or as a pre-workout drink to support performance. The inclusion of Caffeine, in particular, ensures that Complete Thermogenic™ Powder increases alertness and concentration. WHY BUY COMPLETE THERMOGENIC™ POWDER? Unlike the vast majority of competitor supplements, the exact quantity of each ingredient in Complete Thermogenic™ Powder is clearly listed. We don’t need to hide behind ‘proprietary blends,’ or any other fancy marketing terms – we're proud that each ingredient in Complete Thermogenic™ Powder is appropriately dosed, and we want to share that with you. What's more, we ensure that each ingredient is of the absolute highest potency and purity available. 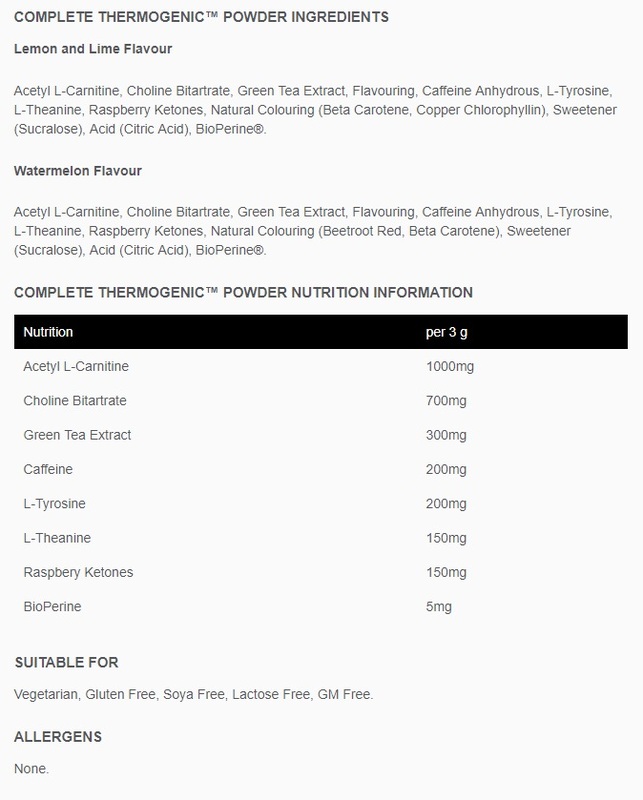 WHAT IS IN COMPLETE THERMOGENIC™ POWDER? 100% pure acetylated form of L-Carnitine which is a popular in many fat burning supplements. An essential nutrient which contributes to the maintenance of normal liver function and lipid metabolism. High strength Green Tea Extract has been included, containing over 10% EGCG and over 20% catechins. Caffeine contributes to increased endurance performance and helps to increase both alertness and concentration. Each serving contains 200mg caffeine. Tyrosine is an amino acid that is, chemically, a pre-cursor to adrenaline. Theanine is the main amino acid found in Green Tea. Ultra-pure, EU compliant Raspberry Ketones at an impressive 150mg per daily serving. A trademarked version of Black Pepper Extract, which ensures that it is the absolute highest quality available. WHO IS COMPLETE THERMOGENIC™ POWDER SUITABLE FOR? Complete Thermogenic™ Powder is ideal for those looking to increase fat metabolism and are also looking to increase alertness before a workout. Available in two great flavours, Complete Thermogenic™ Powder is a great alternative capsules or tablets, and is perfect for those wanting to improve body composition. 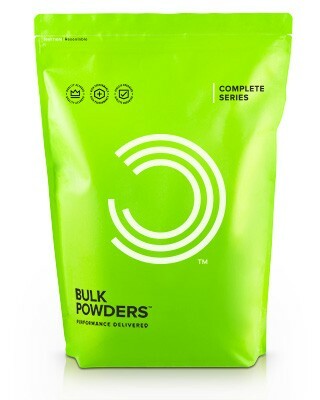 Complete Thermogenic™ Powder is ideal for use in the morning or before a fasted cardio session.